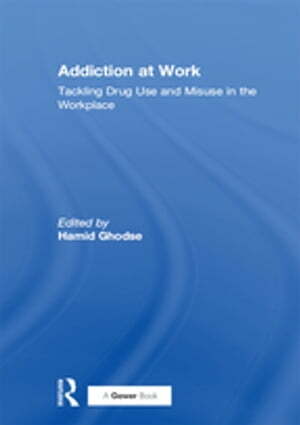 Collins Booksellers - Addiction at Work by Hamid Ghodse, 9781351960762. Buy this book online. Drugs and the workplace just don't mix. Yes, most users of illicit drugs are employed adults and there's a high correlation between levels of stress, income and alcohol abuse amongst professional and managerial employees. But the risks associated with drug use and abuse in the workplace have been well defined. Addiction at Work enables you to understand the background and extent of the problem: the cost of drug abuse to your organization; the role your own organizational culture may have in encouraging drug misuse; the risks associated with dangerous or stressful jobs. There are also chapters to help you understand the symptoms of drug abuse and the potential risks associated with perfectly legal prescription or over-the-counter medicines. The right kind of drug policy can be a significant weapon to fight this problem. So Addiction at Work explores your responsibility as an employer and how to design, communicate and implement a policy that is appropriate for your organization. Finally, there are chapters on the tools and techniques open to your organization for tackling the problem head on; ways of addressing problem behaviours; the advantages and disadvantages of drug screening and the ethics associated with this practice; employee assistance programmes and specialist care and, finally, the employment law issues around drugs. Addiction at Work has been written by some of the world-authorities on drug use in the workplace. It is an essential reference for organizations seeking a way through the human, ethical and legal issues (and the risk they present to any employer) of a social problem that is increasingly impacting employees whatever their work or the nature of their workplace.